Happy Friday! We've been enjoying some beautifully warm weather all week and the sunshine has been doing my soul some good! I admit that it's fun to pull out favorite boots and sweaters each fall, but I'm NOT a fan of cold weather at all. In our house not only does fall mean colder weather, but it also means it's football season and more importantly, marching band season! Our high school football team has finished their regular season games already but we've still got plenty of college games to watch in the next month or so. 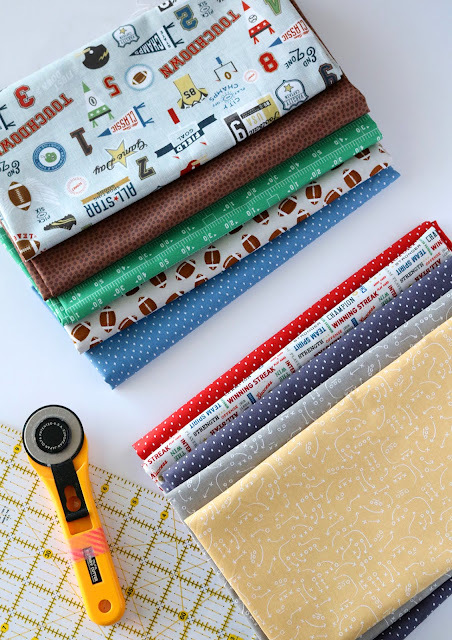 Over the past week I've been sewing with these fun football prints from a new fabric line called Varsity. It was designed by one of my favorite designers, Deena Rutter for Riley Blake Designs. 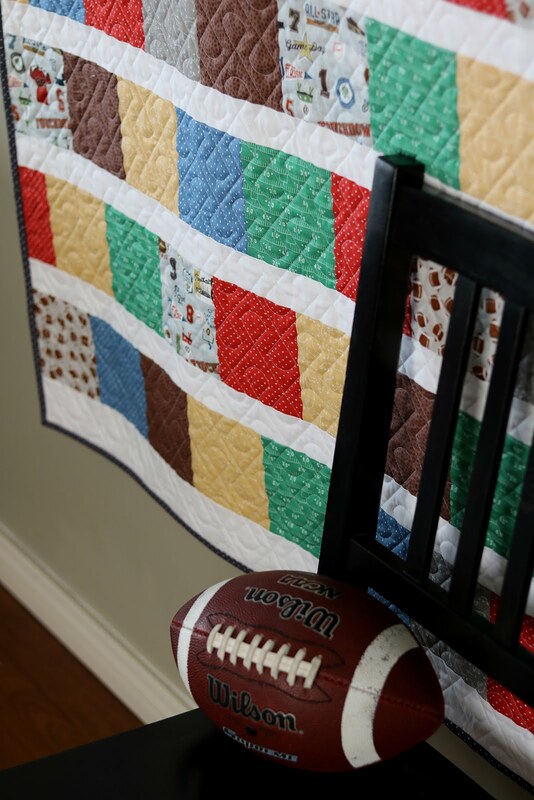 The brown texture print and the green yardline prints are so fun! 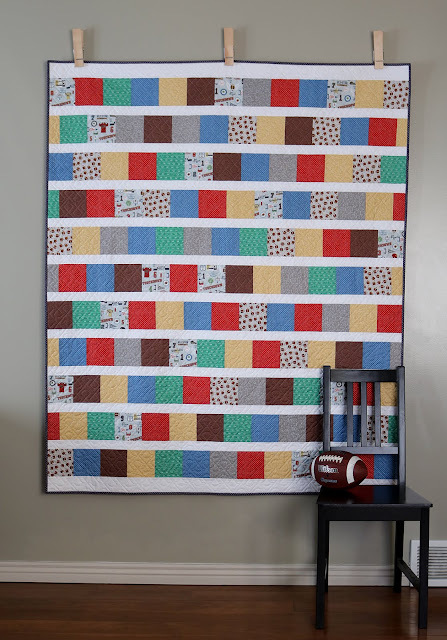 I'm always on the lookout for a great way to use pre-cut squares so I designed this quilt for either 5" squares or 10" squares, but you can totally also use fat quarters, or even just yardage like I did! 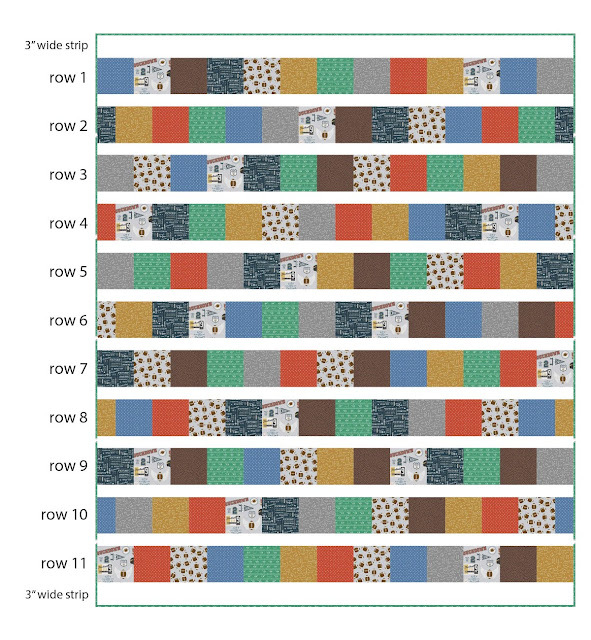 Cut all print fabrics into 5" squares. You'll need 143 total. 1. Divide squares into 11 rows of 13 blocks each. Arrange into rows. 2. For all odd numbered rows (1, 3, 5, 7, 11) sew squares together into one long row. Cut 1/4" from just the two squares on both ends of the rows. Rows should measure 58.5" long. 3. 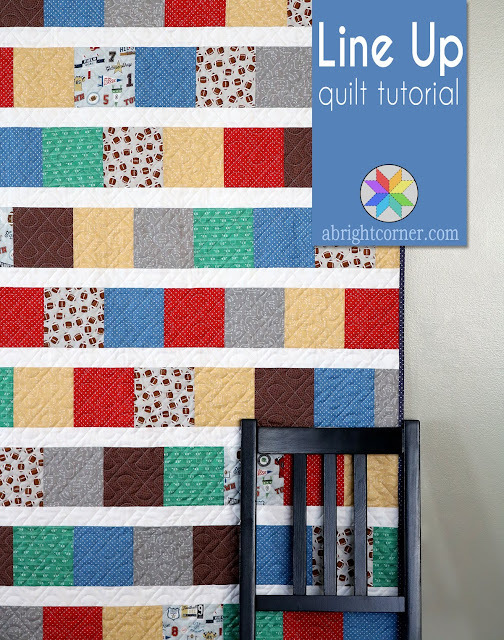 For all even numbered rows, cut one square in half and place the halves on each end of the row. 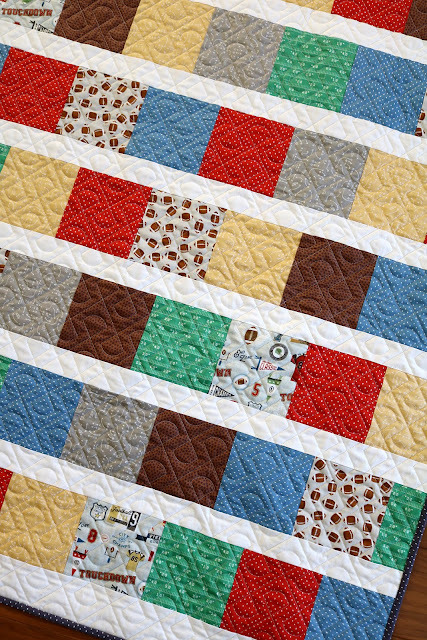 Sew squares together into rows. Rows should measure 58.5" long. 4. 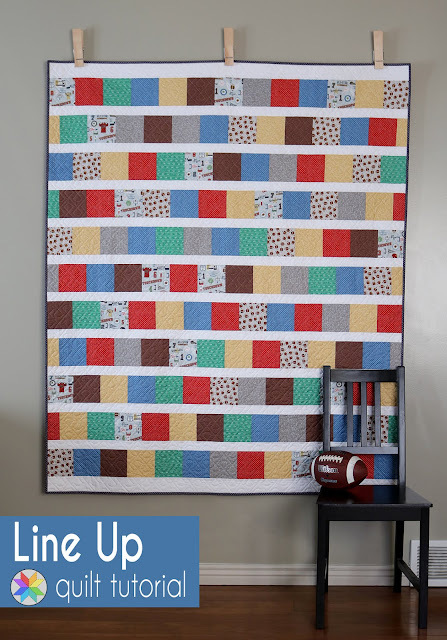 Sew the 2"-wide white strips together end to end to make one long strip. Cut into ten, 58.5"-long strips. 5. Sew the 3"-wide white strips together end to end to make one long strip. Cut into two, 58.5"-long strips. 6. Sew the pieced rows and white strips together as shown in the diagram. The first and last white strips will be the 3"-wide ones. 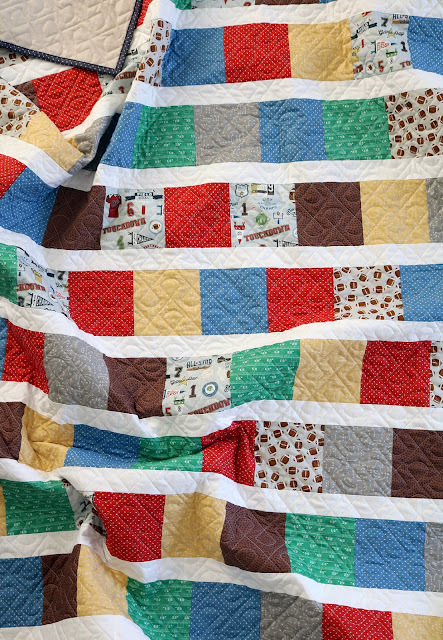 To keep the rows from shifting as you sew them together, find the center point of each row and mark with a pin. When you sew two rows together, match up the center points and then pin along the length of the row. Quilt top should measure 58.5" x 70"
If you make a Line Up quilt I'd love to see it! Tag me on Instagram (@abrightcorner) and use the hashtags #lineupquilt and #abrightcorner so we can all see what you've created! Have a fantastic weekend, and I hope you're able to squeeze in some sewing!